SYNOPSIS: In Burning the Bacon, debut poet L. Austen Johnson navigates through deeply personal terrain, laying waste to it and watching its flowers regrow in the four sections of the collection: “Gravity,” “In Memoriam,” “Entropy,” and “Parthenogenesis.” She explores topics such as chronic illness, love, heartbreak, memory, and growing up with a blend of accessible language and rich metaphor. I was actually in the process of rewriting my review policy and shutting down review requests from authors, when L. Austen Johnson approached me to ask if I’d be interested in reading her poetry collection. I was feeling so overwhelmed by the stack of books I needed to read, that I almost passed, but something about her really struck me, and I am so glad that it did, because this was a genuinely enjoyable little collection of poems. I don’t read a lot of poetry, but I read enough that I’ve come to expect a certain formula from contemporary poetry collections, which is why I was surprised (in the best way) by how refreshing and candid this writing style is. There’s none of the repetition and slowness that I find in a lot of poetry collections, and for it to be such a short book, it tackles so many important topics that more readers than not will be able to relate to, I think. to be known like this—by what needs fixing. for that man-made thing that can actually repair me. While the collection is primarily composed of poems that relate to lost or unrequited love and being wounded by a romantic interest, the pieces that stuck out the most to me were actually the ones about chronic illness. I don’t know what the author’s daily life is like, and I won’t pretend that I can relate perfectly to the things she experiences, but as someone who has suffered from chronic pain problems for many years, I loved how understood I felt by many of these pieces. To wonder what life would be like without our physical limitations is something that a great deal of people can relate to, but the author manages to put those feelings so perfectly into words—what would it be like to snuggle up with my own body? To love my body for everything it is, even when it causes me such heartache? These thoughts are bittersweet, but for such a widely known struggle, it’s not talked about often enough, and I endlessly appreciate L. Austen Johnson’s willingness to go there. All in all, I definitely recommend this poetry collection, especially if the topics involved are familiar ones to you. I think the author is a natural and shows a delightful amount of potential, and I am very interested in seeing what she writes next! All quotes are taken from an ARC and may not match the final release. Thank you to L. Austen Johnson and Gen Z Publishing for providing me with this ARC in exchange for my honest review! 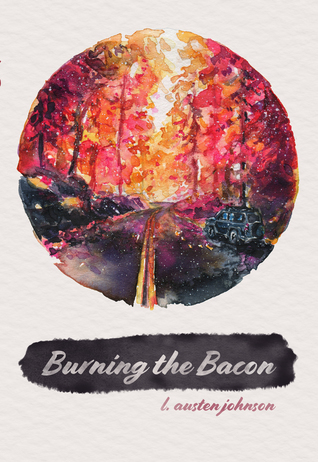 THREE (3) lucky winners can receive a copy of BURNING THE BACON by L. Austen Johnson by clicking the Rafflecopter here! This giveaway is open internationally as long as Amazon ships to your country, and will be open until 11:59PM EST, April 28 2018. The first winner will receive a free paperback copy of BURNING THE BACON by L. Austen Johnson! Two runners-up will receive a free ebook. This sounds fantastic. And it sounds a bit dark, which is right up my alley. Lovely review! Yes, it definitely does have some darker undertones to it – but ultimately I think it’s pretty hopeful, too, so it’s a nice balance! Thank you so much!